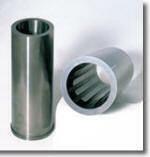 Thanks to state-of-the-art analyzing techniques, Ultra Carbide produces special parts of the highest quality. X-ray-fluorescence analysis, roundness, and shrinkage inspections guarantee that the raw material and the end product fully comply with the required customer specifications. Wherever large quantities of raw materials or finished goods flow at high speeds along conveyor belts or through machines, surfaces in contact with the belts or guide rails are exposed to extreme wear. This applies also to relatively soft and light products such as food and consumer goods, as well as plastic granules used for the production of cling film. Carbide possesses the required resistance to abrasion in order to resist this type of wear and ensures that the machines and equipment operate longer. In the food production industry, this abrasion resistance further prevents the ingress of impurities caused by wear into the food chain. Therefore, Ultra Carbide provides strips, guide rails, form liners, pressure plates, grooved bushes, and wear-protection components and the like for a multitude of applications. Patented production processes and state-of-the-art production facilities make it possible for Ultra Carbide to produce customer-specific special parts of the highest quality and within a short time period. As a customer, you benefit from these investments by taking advantage of perfect tolerances, excellent durability, and optimal efficiency for every individual application. Tools for the cold forming of metals must be wear-resistant, hard and tough at the same time – an ideal application range for carbide. It can withstand the high mechanical and thermal stresses that occur during the plastic deformation of the work piece. In addition, Ultra Carbide also supplies carbide ribbed rolls, cold and smoothing rolls, and mandrels and coining dies for the forming industry. During the development of carbide preforms and wear parts, Ultra Carbide will be your experienced and reliable project partner. We will share with you our expertise regarding the application scope of carbide, and prepare for you a comprehensive documentation package for every component leaving our facilities. Drawing punches available in different carbide grades for the production of tins and cans in the food and beverage industry. Carbide cold heading dies by Ultra Carbide for use in the production of screws. Drawing dies available in different carbide grades that withstand stress during pressing and drawing in the forming process of steel and non-ferrous metals.